Enya: I will seek out the words, and listen then, thank you. But, yes, we all ned something soothing, that's why I do a daily meditation. HP: According to some, we will all get a look at the full report, but when is the issue. NYT: Why does "Lobbying Day," make me nauseous? Oh, yes, that's it, "money in politics!" A day is set aside so that monied organizations can send their minions to twist congressional arms! WTF? Then, is Pence going to tell them that if they would only believe in "The Rapture," all will be well? 4:28 Yup - weave it is. This is the sixth or seventh in a series of articles originally published at Daily Kos and picked up verbatim by AlterNet within about the last month. It's certainly well worth reading, at either place. HuffPo - Esperts do seem to think they have X-ray vision don't they? I don't expect it to happen as fast as I would like it to, but I do think there are enough people of integrity hidden in the process that eventually we will learn. Everything. NYT - This is exactly what Ilhan Omar was talking about - not anti-Semitism. How dare Israel presume to push the United States into a legislatuve agends of its own?Yes, telling us what they'sd like to see is a step in the process of negotiation. Active lobbying and staging demonstrations goes far beyond that. How would we feel if the country doing this was, oh, say Finland? Or Turkey? Or Gambia? Cartoon - Didn't they just. NOT. ENYA: I have her CD, lovely, soothing song! HP: I too, look forward to reading this report. I hope Barr comes through for the people who want to know! NYT: I hope and wish the best for all the activists out there, and that it goes peacefully. Cartoon: One of the most devastating (human made) environmental disasters with 1300 miles effected. I remember it well. Horrible and sad. It's a nice and comfortable day here. Best to you for your meeting tomorrow. Take good care, and Thanks, Tom. Every American has the right to peruse the entirety of Mueller's report and from that draw his or her own conclusions! Freya's right....we PAID for the bloody report and we have every right to know what's in it! Enya: Beautiful song with lovely video. We certainly do need soothing thoughts to help us to take on all of the stresses we hear or face each day. HP: I'm looking forward to what the Mueller's report has to say. We've been patiently waiting through all these 22 months for it being released. NYT: I agree with Joanne and Pat's comments. Cartoon: I remember the disaster very well too. 3:15 You can sharpen your tooth on that one, Puddy Cat. YouTube: Well done, TomCat. After your Republicans on Parade I was in need of something soothing. Enia did the trick for now. While this report does not conclude that the President committed a crime, it also does not exonerate him,” Mr Barr quoted Mr Mueller as writing in his report on the issue of possible obstruction of justice. will only fuel the demand to have the report made public. If there was no collusion, why did Drumpf then obstruct justice? The interpretation of Mueller’s report can’t be left to the Drumpf-appointed and very controversial Barr only. But remember: while Congress and the whole country is quibbling over who should have access to the report and then over what the report actually says, Drumpf and the GOP are pushing their own agenda while no-one is paying attention. NYT: Sometimes I’m just gob-smacked by how much interference by another country Americans allow to take place. The Netherlands and Germany had a diplomatic row with Turkey when they wouldn’t allow Turkish diplomats and cabinet ministers to attend rallies for Dutch and Germans of Turkish decent which Erdogan had organised for his Turkish re-election in their countries. In America thousands of ‘activists’ will come to Washington to press Aipac’s legislative agenda after listening to Israel’s PM and his opponent, the VP of the US and its Speaker, and this has been happening for years? I really don’t know what to say. Cartoon: Yes, they made it very clear: there’s NO benefit, only terrible damage. Those that have protected him and hidden things should go too. That is Obstruction too! Amen Dave. People are people!!! Puzzle — 5:05 Looks a little tough as a salad. Enya — It is playing as I type. Very nice! Huff Po — In Republispeak, transparency = redaction. I hope that the Congress will see the full report and documentation. And as TC says: “… know all the details possible, without compromising either ongoing investigations or intelligence community sources and methods.” Barr is a Republican and Trump appointee. As such, I do not trust him. NY Times — When Trump can’t even govern in the US, why is he trying to “influence” another nation? Netanyahu should be persona non grata. 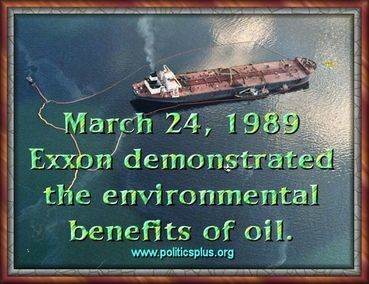 Cartoon — The Exxon Valdez was all over the radio today. Thirty years later and the effects are still being felt.